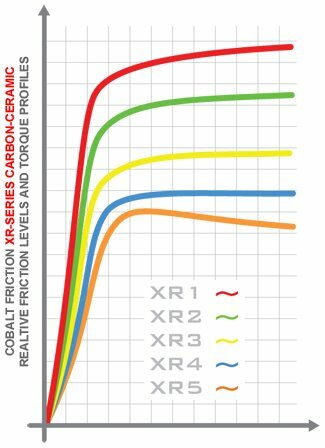 Cobalt XR5 is a specialized low torque material designed specifically for rear-axle applications on vehicles exhibiting a rapid rate and high magnitude of weight transfer under braking, e.g. FWD or low-inertia RWD vehicles. Solid initial bite with a perfectly flat torque profile, transitioning to a negative slope (i.e. negative torque gain versus temperature) virtually eliminates rear lock-up. Cobalt XR5 is the rear-axle compound of choice for championship winning drivers and teams in Grand Am Continental Tire Series, SCCA Spec-Miata, Showroom Stock and IT classes.